Intel’s Chief Data Scientist, Bob Rogers, frequently meets with enterprises to make recommendations on how to best evolve their analytics program. To facilitate the analytics maturity assessment, Rogers asks a number of powerful questions to get at the heart of successes and issues. 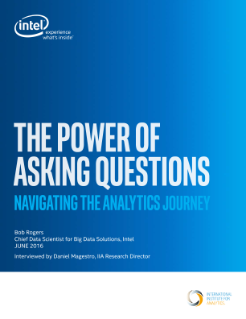 In this conversation with the International Institute for Analytics (IIA), learn more about the key ...considerations the enterprise IT decision makers must weigh as part of their analytics journey.